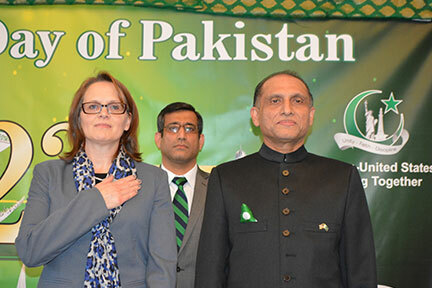 Washington: On the occasion of 78th Pakistan Day, Embassy of Pakistan in Washington D.C. held an impressive reception on 23rd March, 2018 which was attended by senior U.S. officials, foreign diplomats and Pakistanis in Washington. Ambassador Aizaz Ahmad Chaudhry, Mrs. Najia Aizaz Ahmad and senior Embassy officials and their spouses greeted the honorable guests. In his remarks, the Ambassador recalled the historic struggle for Pakistan’s freedom and emphasized that the democratic ideals and values espoused in the Lahore Resolution of 1940 guided the Muslims of the Sub-Continent to independence in 1947. “These remained relevant even today” he said. The Ambassador added that in just 70 years since its independence, Pakistan had achieved a lot of successes and it had the potential to achieve even more in the years to come. He highlighted that the country’s economy, energy, and law and order situation had improved significantly in the last few years. On Pakistan-U.S. relations, he said both countries enjoyed historic and longstanding ties that had seen many ups and downs but had always remained resilient. He expressed the hope that both countries will work together to attain common objectives and secure shared interests. The Ambassador shared with the audience extracts of several messages of felicitation received on Pakistan’s National Day from U.S. Senators, Congressmen, Governors, as well as state officials and other U.S. dignitaries. The event was attended by a large gathering of over 500 guests from all walks of life including US Government, diplomatic corps of Washington D.C. as well as members of the Pakistani American diaspora. They were served with traditional Pakistani cuisine as well as Pakistani music. Earlier an elegant flag hoisting ceremony was held at the Embassy of Pakistan Washington D.C. to commence Pakistan Day celebrations. Ambassador Aizaz Ahmed Chaudhry raised the Pakistan flag at the Embassy courtyard with the National Anthem playing in the background. In his remarks, the Ambassador congratulated Pakistanis all over the world, particularly in the United States of America on the 78th Pakistan Day. He paid rich tribute to the founding fathers who resolved at Lahore on 23 March 1940 to establish a separate homeland for the Muslims of the Sub-Continent under the leadership of Quaid-e-Azam Muhammad Ali Jinnah. He shared that in the last few years, Pakistan had taken great strides in achieving macro-economic stability, improved law and order situation and ensuring continuity of democracy. Ambassador Chaudhry particularly commended the patriotic zeal and fervor of the Pakistani American community and urged the diaspora to continue to play its role as a bridge between Pakistan and the United States. Senior officials of the Embassy read out aloud the special messages of President Mamnoon Hussain and Prime Minister Shahid Khaqan Abbasi congratulating the entire nation on this historic day. A group of officers from the US foreign service also witnessed the flag hoisting ceremony.